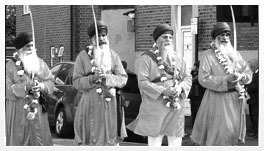 The Gurdwara organizes and encourages many visits to the Gurdwara every year by local schools and other organizations. The aim of the visits is to give a wider understanding to school age children of the basic tenets and practices of Sikhism. The format of a visit can be tailored to the needs of a specific school, and usually comprises a basic introduction upon arrival, a short talk by the Education Welfare Officer in the main Diwan hall, followed by an opportunity for questions. The visit is concluded with a small vegetarian meal in the langar hall. During the visit everyone will be required to cover their head, although some handkerchiefs/ scarves are provided it is a good idea to bring your own. School visits can be arranged by contacting us via email or phone with the following information: Contact name and telephone number, the date you wish to visit the number in your group and their age range.